It's Official! Dreams To Creations turned 1 this month! We couldn't believe how far we've come since the start of this blog. Truthfully, we didn't know if anyone would be interested in our reviews and ramblings, however, the support we've gotten has been amazing and we want to thank you guys for it! To celebrate our blog's first anniversary, we've got a few giveaways lined up! Yup, you read right, a few. We decided to do multiple giveaways, so our dear readers will have more chances to win! This means you can enter in all of our giveaways. Even if you win one of our '1 Year Blogiversary' giveaway, you can still enter the others for a chance to win. Alright, now let's get to business. The first giveaway package is called the Pretty In Pink Package! Since it is Wednesday and it's all pink. 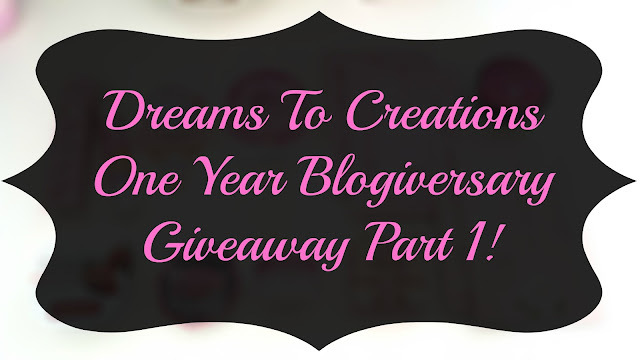 As always, this giveaway is open internationally! Did you notice that they are all pink? Or at least their packaging anyways! This Pretty In Pink prize package comes with a variety of skin care and makeup goodies. As mask lovers, we've included some of our favorite masks in this package. Such as the My Beauty Diary Strawberry Yogurt masks, which smells divine by the way, and the My Beauty Diary Bulgarian White Rose masks, which are very soothing. We've also included some unique masks such as the Innisfree Capsule Recipe Pack Pomegranate Bubble sleeping pack (what a long name), which bubbles when you apply it! Of course there's got to be some wash-offs masks too! As for makeup, we've got some basic and not so basic products in this package. You can never go wrong with black mascara and a pink lip product, so we've included one volume mascara and one matte pink lip crayon. Multi purpose products are quite popular nowadays, so our lucky winner will find a cream lip and cheek product in this prize package as well. At the end of the day, all is to be cleansed, so we added one of our favorite cleansing sherbet to the mix. There's also a cute nail deco, oh, and for an extra touch of pink and cute, we added a pink lollipop soap! - One EnSOAP pink Lollipop soap. - Two My Beauty Diary Strawberry Yogurt sheet masks. - Two My Beauty Diary Bulgarian White Rose sheet masks. - One Shara Shara Petit Friend Matt Lip Crayon in PK01 Pure Pink. - One Rivecowe Plenty Volume Mascara in #1 Black. - One Y.E.T. Kiss Me Touch Me Lip & Cheek in 01 Apricot. The Pretty In Pink package is curated by Dreams To Creations. The giveaway ends on September 21, 2015 at 11:59pm PST and one winner will be selected at random by Rafflecopter. I'd really like to try the Annie's Way Calendula Softening Jelly Mask you reviewed. I'd like to try the Innisfree Seaweed Capsule Recipe Pack. Also, the Annie's Way mask looks interesting, too. I'd like to try the I'm From Honey Mask. I'd like to try My Beauty Diary Bulgarian White Rose sheet mask. I'd love to try any My Beauty Diary mask as I've heard so much about them but never tried them myself. Would love to try the Botanic Farm Polar Energy Hydrogel Mask Pack Camel Milk one. 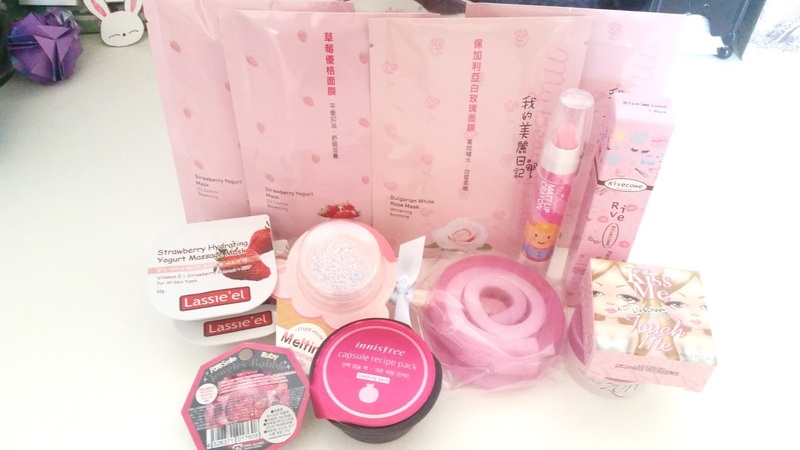 I'd like to try the My Beauty Diary Strawberry Yogurt masks! I'd try Innisfree Super Volcanic Pore Clay Mask!